There are 41 drivers entered to attempt the 40-car field, including both JP Motorsports drivers Josh Bilicki (#45) and Stephen Leicht (#55), who weren’t on last week’s preliminary list. One driver will fail to qualify. Third in last year’s ARCA Racing Series standings when he drove for Kerry Scherer, North Carolina native Shane Lee is set to make his XFINITY Series debut this Saturday. He takes the place of Cup regular Ty Dillon in Richard Childress’ flagship #3. Childress’ winery will sponsor the effort, as it had both Brian Simo’s strong Cup race at Sonoma in 2005 and Kirk Shelmerdine’s 20th-place finish in the 2006 Daytona 500. Lee has three Truck Series starts on his resume, all of them in 2016 with a best of 16th at Gateway and Texas. After a one-week hiatus, Tommy Joe Martins is back in McLeod’s #8, and he’s brought with him several new sponsors. Announced on Monday were Knoxville-based AAN Adjusters, Inc., Red Angus, and KT Rental Cabins, which will adorn a black-and-red paint scheme. Martins, who was originally set to debut his own team in this race last year, finished 33rd in last August’s XFINITY race. Additionally, team owner B.J. McLeod will carry sponsorship from EPIC Racewear on his #78. It’s another game of musical chairs at Penske Racing, which has not entered the #12 for Austin Cindric, but instead moved him to the flagship #22 team. The team eyes its third-straight series victory as Cindric takes the place of both Joey Logano, who won Fontana, and Ryan Blaney, who took the checkers last week in Texas. After Matt Mills failed to qualify at Texas, Joe Nemechek is again listed as driver of Johnny Davis’ fourth car. Nemechek has made 20 XFINITY starts at Bristol, but none since this race in 2014. His best finish at the track came in 1993, when he finished runner-up to Todd Bodine. Joining Shane Lee as an ARCA driver making his XFINITY Series debut is Tony Mrakovich, the 19-year-old driver from Elizabethtown, Pennsylvania. Mrakovich has just four ARCA starts, most recently his 29th-place finish in this year’s Daytona opener, where he drove for series veteran Andy Hillenburg. Mrakovich takes the place of Dylan Lutpon, whose best finish in the season’s first six races was his 17th-place showing last week in Texas. UPDATE: Lupton ended up driving the #28 on Saturday. John Hunter Nemechek eyes his third XFINITY Series start and his first since Fontana, two weeks ago. He again takes the place of Cup regular Jamie McMurray and brings sponsorship from Fire Alarm Services, Inc. The younger Nemechek has made four Bristol starts in the Truck Series with a track-best 3rd in the summer of 2015 and 2017 and no finishes worse than 8th. The Jimmy Means team carries a new look this weekend with Franklin Signs & Graphics as the primary sponsor. In so doing, Franklin builds on their business relationship with Means as decal supplier and paint scheme designer. Welcome back Ty Majeski, who makes his first XFINITY start of 2018 following a three-race stint last season. Majeski takes the place of Chase Briscoe, who ran 11th last week in Texas. 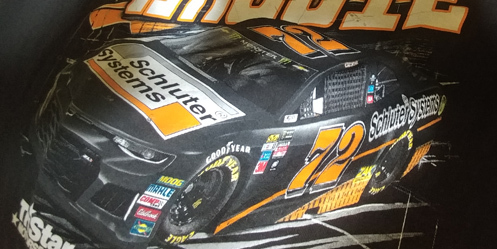 Majeski will carry sponsorship from SunnyD, a brand shared by his Roush-Fenway Cup teammate Ricky Stenhouse, Jr.
UPDATE: Harmon's team brought out the Dodge for the first time since Daytona and Cody Ware drove in place of Harmon. Chase Briscoe moves from the Roush-Fenway #60 to the #98 this week, taking the place of Cup regular Kevin Harvick, who isn’t entered. Briscoe looks to keep up a solid start to the year with not only last Saturday’s 11th-place finish, but a 15th in Atlanta. There are 39 drivers entered for Sunday’s main event, the most starters since the Daytona 500, but still the seventh-straight short Cup field in 2018. In this race last year, 39 drivers also took the green. After running without a primary sponsor last week, Rick Ware Racing’s entry for Harrison Rhodes has Industrial Construction Experts, Inc. listed as the backer. Rhodes finished a season-best 22nd last Sunday in Texas. Carl Long’s single-car operation makes its first attempt since this year’s Daytona 500 (after withdrawing from Texas). Behind the wheel is Chad Finchum, set to make his Cup debut. Finchum has 13 XFINITY starts on his resume with a best finish of 28th twice, one of them at Bristol last summer. Sponsorship from Concrete North, Inc. and Smithbilt Homes will back both his #66 Toyota on Sunday as well his XFINITY ride in MBM’s #40 on Saturday. This Sunday, Corey LaJoie returns to TriStar for the first time since Phoenix, when he scored his second early engine failure in as many starts driving the #72 Chevrolet. Curiously, these have been the TriStar team’s only DNFs in 2018. Will the car hold together this time, as it did last Sunday for Cole Whitt? Or will LaJoie finish last for the third time in as many starts in 2018? D.J. Kennington and the GBR team continue to build their short track notebook this weekend as they return to action for the first time since Martinsville. As of this writing, the team does not have a primary sponsor listed. UPDATE: The car, as well as a decal on Michael Annett's XFINITY entry, will honor the lives of the lost members of the Humboldt Broncos hockey team. On Monday, Landon Cassill announced that, following his 21st-place finish in Texas, he’s going to drive Derrike Cope’s #00 again this Sunday. After two weeks with sponsorship from the U.S. First Responders’ Association, another new sponsor has signed – TW Cable. Think Kevin Harvick struggled last week on pit road? Exactly one time in NASCAR history, a driver finished last with the listed cause of “lug bolts.” The date was Independence Day, July 4, 1962, during the Firecracker 250 at Daytona. Bob Welborn, who won the first Daytona 500 pole three years earlier, was entered in a 1962 Pontiac #12. The car was fielded by Cliff Stewart, who two decades later would enter Pontiacs for the likes of Rusty Wallace, Geoffrey Bodine, and Morgan Shepherd. On this day, however, the #12 made it just one lap around the track before the car fell out, citing the lug bolt issue. Welborn edged Tommy Irwin for the spot after Irwin’s #27 lost oil pressure.